Kaolin Market size was valued at over USD 4.5 billion in 2015 and will witness gains more than 4% CAGR by 2024. Metakaolin Market size was roughly around USD 100 million in 2015 and is projected to observe growth close to 4.5% over the estimated timeframe. 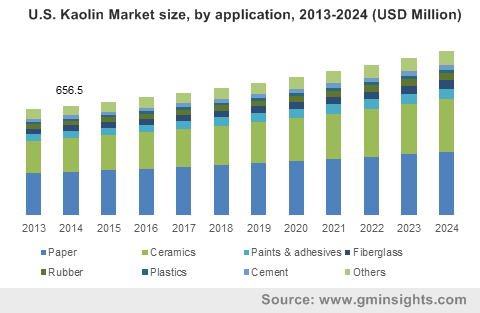 Positive growth indicators in the end-user industries including ceramics, construction, paper, paints & adhesives and plastics in the past few years is analyzed to be the major factor propelling the overall kaolin market size. The product due to its superior opacity, chemical inertness, non-abrasive texture and flat particle shape is suitable to finds widespread applications in the ceramic, paints and adhesives industry. In addition, metakaolin, particularly due to its high thermal stability is broadly used in applications such as concrete and mortar. The product is widely used in the plastic industry to enhance its electrical performance, durability and strength. Escalating plastic and polymer business in trend towards replacing metal and steel with light weight products will substantially boost the kaolin market size in the near future. Furthermore, the product is also in the rubber such as SBR, EPDM and neoprene to magnify its electrical and mechanical traits. Increasing demand of these rubbers in tire manufacturing along with increasing automotive manufacturing and sales will positively boost the kaolin & metakaolin market share by 2024. However, declining print media demand in North America and Europe on account of increasing consumer awareness towards electronic media may hamper industry growth in the near future. In addition, the product faces prominent substitute threat in paper applications from calcium carbonate, which may negatively impact on the industry growth. The global kaolin market size for paper applications led the overall industry in 2015 and is likely to observe prominent gains close to 3.5% by 2024. The product is majorly used in the paper applications as a particulate mineral in filling and coating. It enhances its appearance, gloss, printability, brightness, opacity and smoothness. Enormous paper demand in Asia Pacific and Latin America for media and advertisement will positively influence the business growth by 2024. The global kaolin market size for ceramic applications is projected to experience maximum growth more than 4.5% CAGR in terms of volume. The product is majorly used in the ceramic tiles manufacturing to enhance its thermal resistance. Escalating construction industry has substantially increased ceramic tiles demand for flooring and wall applications, owing to push the overall industry size in the near future. Furthermore, robust growth in the flooring industry particularly due to improving consumer lifestyle dynamics will complement the business growth by 2024. Concrete led the overall metakaolin market share in 2015. The product is majorly used in concrete to enhance its splitting tensile, compressive strength and flexural strength. Concrete is an essential product used in the construction industry. therefore, strong growth in the construction industry will subsequently boost the industry growth by 2024. In addition, metakaolin market size for mortar applications is likely to observe growth close to 4% between 2016 and 2024. The product is majorly used in the construction materials such as paints & adhesives, ceramic tiles, concrete and mortar. Therefore, robust growth indicators in the construction industry in the past few years will positively influence the kaolin market size by 2024. For instance, the global construction spending in 2013 was roughly around USD 7 trillion and is projected to exceed USD 13 trillion by 2024. The construction industry is primarily driven by increasing government investments towards enhancing their public infrastructure along with upcoming residential and commercial projects. In addition, increasing consumer spending capacity, has substantially driven ceramic tiles demand for aesthetic floor and walls. This trend shall further complement business size over the estimated timeframe. North America kaolin market size was close to USD 1 billion in 2015. Positive growth indicators in the regional construction industry post 2008 economic turmoil along with increasing residential remodeling practices in the U.S. has positively influence the product demand. Furthermore, drifting consumer focus towards replacing wood floors with ceramic tiles, particularly due to its easy installation, aesthetic appearance and superior characteristics will complement industry size in the coming years. In addition, North America accounts for more than 20% of the global metakaolin market share in 2015. Asia Pacific led the global kaolin market size in 2015 and is projected to expand with highest growth of over 4.5% between 2016 and 2024. The regional growth is primarily driven by escalating construction industry in China, India and Japan. Furthermore, improving consumer lifestyle dynamics in the region, which results in growing end-user industries such as automotive will complement the regional industry size over the estimated timeframe. The global kaolin market share was moderately consolidated with top five product manufacturers holding roughly around 40% of the overall industry share in 2015. Some of the industry share contributor includes BASF SE, Imerys SA, Daleco Resources Corporation, I-Minerals Inc., Kaolin AD, KaMin LLC, SCR-Sibelco N.V, LB Minerals Ltd, Quarzwerke GmbH, Thiele Kaolin Company, Vale SA, Stephan Schmidt KG, Morien Resources Corporation, Lasselsberger GmbH and Xatico Sàrl. Key players in the industry are involved in strategic mergers and acquisitions in order to strengthen their presence. For instance, in 2014, Imerys S.A and Nedmag entered in a collaboration. In addition, key industry share contributors including Imerys, KaMin and BASF have presence across multiple stages in the industry ecosystem, which them in holding a substantial share in the business. Kaolin (China clay) offers value added characteristics such as opacity, chemical inertness, non-abrasive texture and flat particle, which makes it suitable in widespread industrial application spectrum such as ceramic, rubber, fiberglass and paper. Robust growth in these abovementioned industries is the major factor contributing the overall business growth. Increasing product demand in construction material and automotive parts such as tire manufacturing will further complement business growth by 2024. Asia Pacific accounted for the maximum share in the global kaolin and metakaolin industry. Strong growth in China and India construction industry was the major factor influencing the regional growth.